JOHANNESBURG (AP) — Richard Van As, a South African carpenter, lost four fingers from his right hand to a circular saw two years ago. He was unable to afford the tens of thousands of dollars to get a myoelectric hand, which detects a muscle's electric impulses to activate an artificial limb. "After my accident, I was in pain, but wouldn't take painkillers. I barely slept, and the more pain I had the more ideas I got," he told The Associated Press. "Sometimes you have to chop fingers off to start thinking." He decided to build his own hand. After seeing a video posted online of a mechanical hand made for a costume in a theater production, he reached out to its designer, Ivan Owen, in Seattle. Enter Robohand — a device that Van As and Owen invented that is made from cables, screws, 3-D printing and thermoplastic. It uses the rotation of a joint to enable five plastic digits to grasp. The device looks like a robot's hand in a science fiction movie, costs about $500 to make and can be reproduced using plans on the Internet and a 3-D printer. Van As is now on a mission to spread the mechanism to people without fingers or hands all over the world. The two gadget-lovers collaborated on developing a design for the device for a wide range of ages that could be used to grab objects, unlike most existing arm prostheses. Van As has fitted Robohands on about 170 people, from toddlers to adults, thanks to donations. At first they used a milling machine, making Van As a metal robotic forefinger digit that helps him work in carpentry to this day. That's when they perfected the shape for the robotic fingers. "Ivan was a gift to me," Van As said. Then they turned to 3-D printing which creates the device in plastic. The 3-D printer gives much greater flexibility, allowing the device to be re-sized on the computer for each user and then manufactured through the printer. A glove-like covering is fitted in thermoplastic, and then fingers are created on the 3-D printer by melting and stacking plastic to make Lego-like digits which are connected to the glove with small cables and screws. The team got a boost when two printers were donated by the Brooklyn-based Makerbot, one for use in Johannesburg and the other for Seattle. "What was taking us two weeks to put together took us 20 hours," Van As said. He opened drawers full of bolts, screws and leftover hinges from the beginning phases of the project. "Now it looks easy." They then started working on a design to help children with Amniotic Band Syndrome, a condition where children are born without appendages because their circulation is cut off in the womb by amniotic bands. To spread the device as widely as possible, they made the Robohand an Open Source design available online, and Van As now collects donations to make hands for people around the world. "I don't want to make money out of misery," Van As said, dismissing the idea that he could make a profit on the mechanical hand. Robohands are different from other prostheses for three simple reasons: "functionality, simplicity and cost," Van As said. He started with $10,000 in donations from around the world. "I said I'd do about 100 hands then disappear, but it keeps going," said Van As. "How do you say no?" Owen stopped working with Robohands in January to focus on education, "specifically on how to introduce the students of today to 3-D printing," he said. At $500, a Robohand is significantly cheaper than the typical $10,000 to $15,000 cost for a conventional below-the-elbow prosthesis, said Eric Neufeld a U.S.-based certified Prosthetist and Orthotist and the director of Range of Motion Project, known as ROMP, which provides prosthetic limbs to those who cannot afford them around the world. "There are very few options just for digits, so that is another problem they are addressing," Neufeld said. "It's a pioneering thing they are doing. It gets people thinking about what other components can be made in the same way," he said, adding that he will watch Robohands closely for possible use by his organization. Eventually, Van As said he'd like to see Robohands kits available for sale at stores, so that anyone could simply build one for themselves. He's waiting for the design to be patented. Already people from Australia to Newfoundland are volunteering to print Robohands. "We took the 3-D printing world by surprise," Van As said. "It wasn't the first medical breakthrough in the 3-D world, but people are eager to get a hold of it now." Van As grins as he holds up a tiny white and blue Robohand in his shop. "This is for a 2 ½ year old in Australia." Casts of other arms are strewn about the garage workshop, which is also full of spools of 3-D printing material, machines, experiments and constructions. 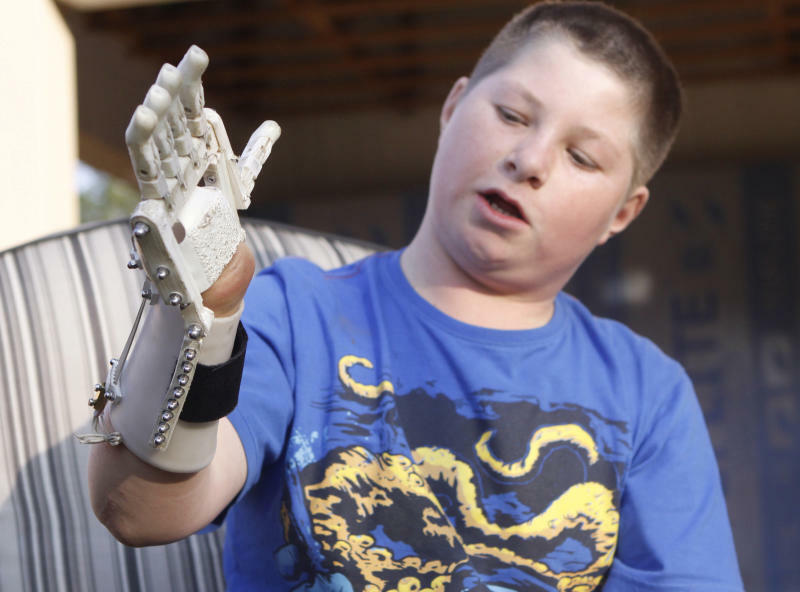 Twelve-year old Dylan Laas got his Robohand in March. 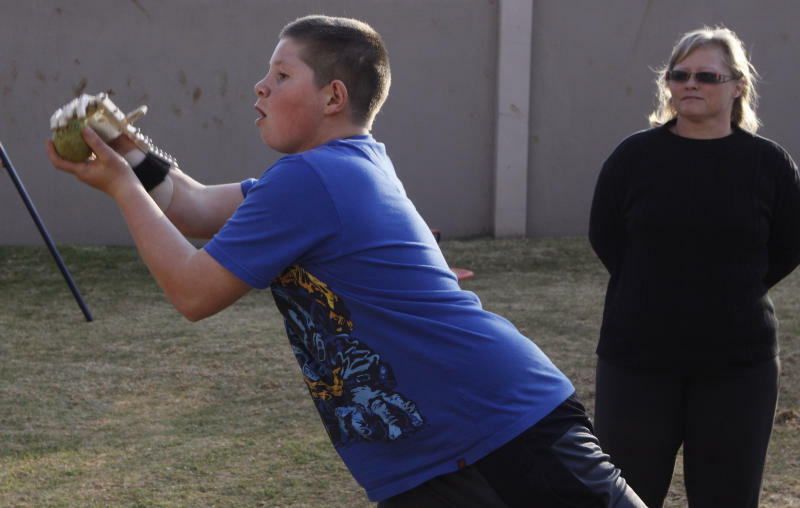 His mother, Jacqui, said her son, who does not have a right hand because of Amniotic Band Syndrome, is approaching activities with new interest thanks to the gadget. "It looks cool. It makes me look like Darth Vader ... It's fun to use," he said, adding that he can't wait to go swimming with it.